Depending on the situation, there are several methods that you can use to remove issues from a plan. 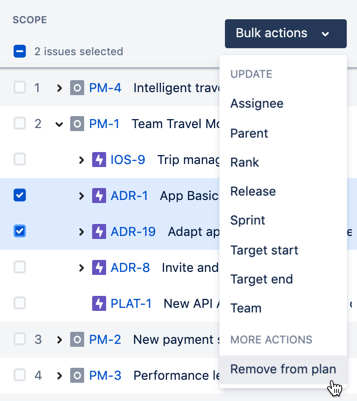 Note that you cannot delete issues directly from a plan, if these issues have already been saved in Jira. You'll need to delete the issue from Jira, and to do this, you'll need the 'delete issue' project permission. This works for issues that are already saved in Jira, which essentially means the issues already exist in your Jira instance. When you do this, the issues are removed from the plan, but still exist in Jira. This also works for issues you've created in your plan, that have not been saved in Jira yet. By doing this, the issues are actually deleted from your plan. In the scope section of the plan, click the checkboxes of the issues you want to remove. Click the Bulk actions menu > Remove from plan. Click Review changes. The 'Review changes' dialog will display, with all changes selected by default. Make sure the checkboxes for the issues you want to remove are selected, then click Save selected changes in Jira. This only works for issues you've created in your plan, that have not been saved in Jira yet. By doing this, the issues are actually deleted from your plan. After making changes in the roadmap view of your plan, click Review changes. The 'Review changes' dialog will display. Click the checkboxes of the issues you want to remove. This only works for issues that have already been saved in Jira, which essentially means the issues already exist in your Jira instance. Click Edit sources. This will display the 'Create plan' wizard. Follow the steps of the wizard until you reach the last step, where you're confirming the scope of your plan. In this step, clear the checkboxes of the issues you want to remove.